A natural law regulates the advance of science. Where only observation can be made, the growth of knowledge creeps; where laboratory experiments can be carried on, knowledge leaps forward. Seen in various places, but Webmaster has found none with a source citation, and doubts the authenticity, because none found with attribution to Faraday prior to 1950. The earliest example Webmaster found is in 1929, by Walter Morley Fletcher in his Norman Lockyer Lecture. 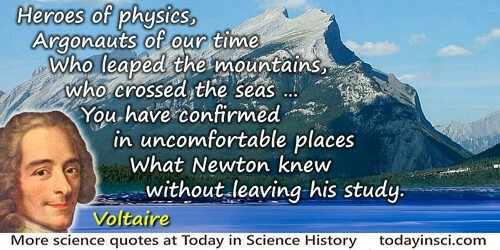 He refers to it as a “truism,” without mention of Faraday. He says “law of our state of being” rather than “natural law.” See the Walter Morley Fletcher page for more details. 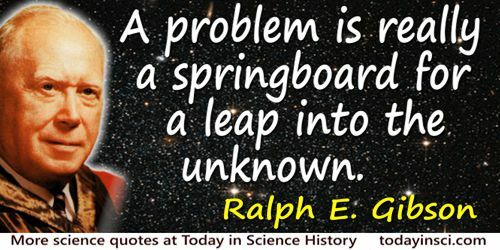 A problem is really a springboard for a leap into the unknown. It is slower, but better, to creep along the downward path that to leap over the cliff. Aphorism as given by the fictional character Dezhnev Senior, in Fantastic Voyage II: Destination Brain (1987), 144. Knowledge is necessary too. A child with great intuition could not grow up to become something worthwhile in life without some knowledge. However there comes a point in everyone’s life where only intuition can make the leap ahead, without knowing precisely how. Nothing is accomplished all at once, and it is one of my great maxims, and one of the most completely verified, that Nature makes no leaps: a maxim which I have called the law of continuity. Letter to de Volder, in Nouveaux Essais, New Essays (1703) translated by A. G. Langley (3rd ed. 1949). In Frederick Copleston, A History of Philosophy (1999), 292. In Science is a Sacred Cow (1950), 127. Talent jogs to conclusions to which genius takes giant leaps. 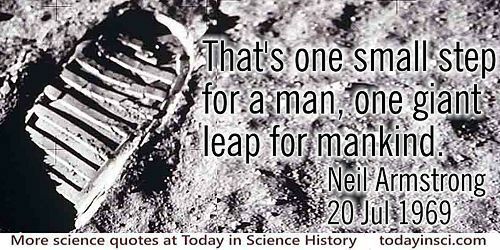 Said as he stepped onto the Moon at 10.56 (G.M.T) on July 21st 1969. However, this is often misquoted as “That’s one small step for man, one giant leap for mankind.” This was due to static during Armstrong's transmission to earth. The 'a' was left out of his statement, ruining the contrast he had made between one man 'a man' and all mankind 'man'. Quoted in Nature, 1974, 250, 451. Information on the frequent misuse of this quote is given in Paul F. Boller and John George (eds. ), They Never Said it: A Book of Fake Quotes, Misquotes and Misleading Attributions (1989), 4-5. The creative element in the mind of man … emerges in as mysterious a fashion as those elementary particles which leap into momentary existence in great cyclotrons, only to vanish again like infinitesimal ghosts. In The Night Country (1971, 1997), 215. In The Process of Education (1960). We all remember the fairy tales of science in our infancy, which played with the supposition that large animals could jump in the proportion of small ones. If an elephant were as strong as a grasshopper, he could (I suppose) spring clean out of the Zoological Gardens and alight trumpeting upon Primrose Hill. If a whale could leap from the water like a trout, perhaps men might look up and see one soaring above Yarmouth like the winged island of Laputa. 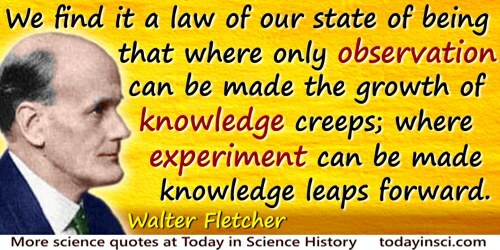 We find it a law of our state of being that where only observation can be made the growth of knowledge creeps; where experiment can be made knowledge leaps forward. From Norman Lockyer Lecture delivered before the British Science Guild (19 Nov 1929), 'Medical Research: The Tree and the Fruit', in The British Medical Journal (30 Nov 1929), Vol. 2, No. 3595, 995. Fletcher introduces this statement as a “truism,” without mention of any prior person saying it. 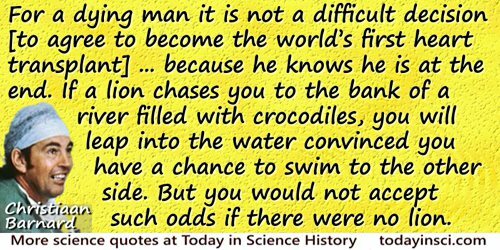 Yet it is very similar to a quote often seen, perhaps incorrectly, as a quote attributed to Michael Faraday: “A natural law regulates the advance of science. 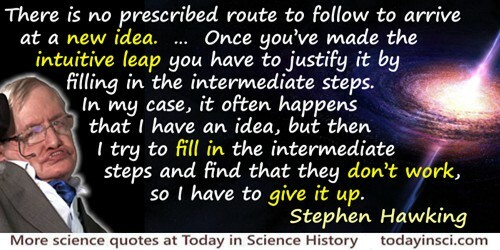 Where only observation can be made, the growth of knowledge creeps; where laboratory experiments can be carried on, knowledge leaps forward.” Webmaster has found no instance of this quote being made prior to 1929, which raises the suspicion that Faraday did not originate it — else why is it not easily found in his written work or quoted in a book in all the years since his time? If you know a primary source linking it to Faraday, please contact Webmaster.